RAA-100 Rock Abrasiveness Apparatus - OFI Testing Equipment, Inc. 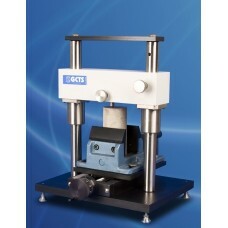 The GCTS Rock Abrasiveness Apparatus (RAA-100) is used for measurement of rock abrasiveness under the standards specified by the Cerchar test. The test consists of measuring the wear flat on the standard steel indenter with 200 kg/mm2 hardness loaded with 70 N force, after it has scratched 10 mm distance on the rock surface. The indenter is examined under the microscope and the amount of wear is correlated to the Cerchar Abrasiveness Index (CAI). RAA-100 features precision slide for smooth movement of the rock specimen over the required scratch distance. It also comes with graduated knob for accurate scratch distance control with 0.01 mm precision. The slide movement is controlled with precision threaded acme rod with 1 mm pitch (1 mm horizontal movement per knob revolution). Note: Requires microscope to measure wear flat on the steel cone. Sold as an option.